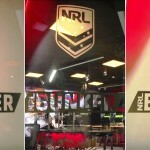 Located at Australian Technology Park in Eveleigh, Sydney the NRL Bunker is a new state of the art centralised facility for live in-game decision reviews. It is the first of its kind in Australian sport. Incorporating 10m2 of our Switchable Privacy Glass into the facility’s design plans has given scope for the Review Officials to monitor games in private or transparently at the flick of a switch.